"Happy Birthday David!" 20th Century Fox Release New Viral Video for Ridley Scott's 'PROMETHEUS'! 20th Century Fox continue pumping the promotional machine for Ridley Scott's highly anticipated return to sci-fi, his behemoth Prometheus. 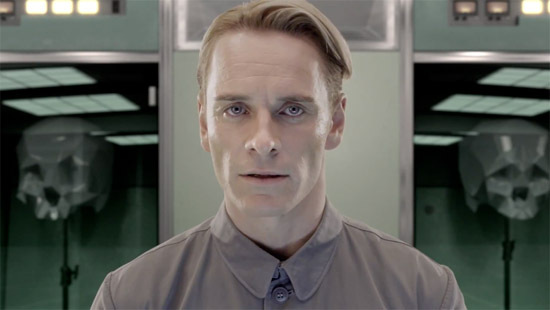 This is the second video promoting Michael Fassbender's android David & this time around we celebrate his birthday. Prometheus arrives in 2D, 3D & 3D IMAX theaters this June 8th & stars Noomi Rapace, Michael Fassbender, Charlize Theron, Idris Elba, Sean Harris, Kate Dickie, Rafe Spall, Logan Marshall-Green & Guy Pearce. The video is quite intriguing & makes a nice slight to David's perception of ethics. Hit the jump for the details. Thanks to Prometheusnews.net for the heads up. I'm reading: "Happy Birthday David!" 20th Century Fox Release New Viral Video for Ridley Scott's 'PROMETHEUS'!Tweet this!